Information is the key to prevention. 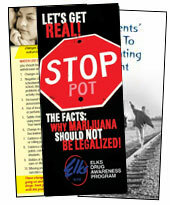 Learn the truth about drugs and alcohol to help keep your children drug-free. Cómo Puedo Notar Si Mi Niño Está Utilizando Las Drogas? Looking for print versions of our literature? Print versions of some of our Drug Awareness literature is available for free by contacting your state's Drug Awareness chair. * Marked items are available in a printed versions.